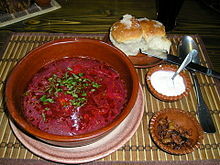 Borscht is a soup o Ukrainian origin that is popular in mony Eastren an Central European cuisines, includin those o Ukraine, Belaroushie, Poland, an Roushie. ↑ Sydney Schultze (2000). Culture and Customs of Russia. Greenwood Publishing Group. pp. 65–66. ISBN 978-0-313-31101-7.